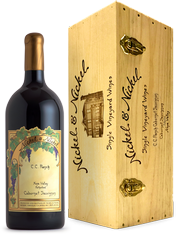 Red Wine by Nickel & Nickel from Napa Valley, California. The 2013 C.C. Ranch Cabernet Sauvignon offers gorgeous raspberry and black cherry aromas, leading to a bright palate of cherry flavors melded with chocolate, floral notes and a hint of Rutherford.